Weddings take many forms—religious, non-religious, and quirky-fun. 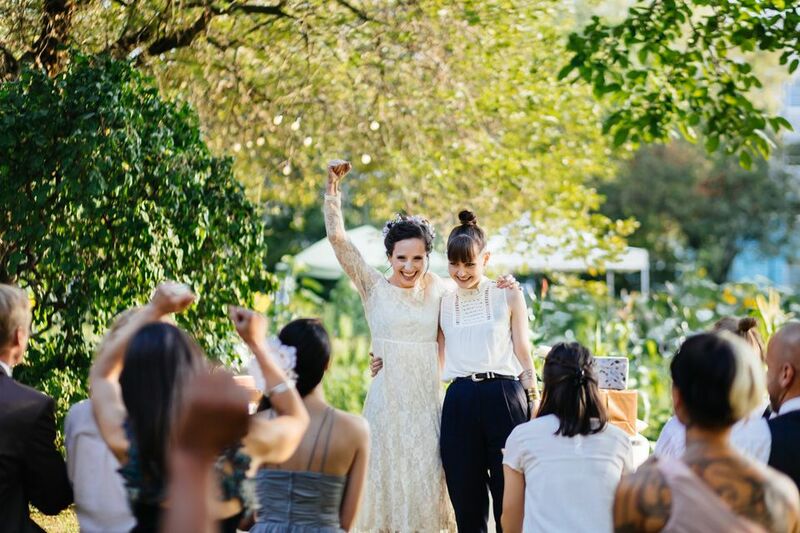 It is not unusual for couples to choose to go the non-traditional route, whether that means having a non-religious ceremony or being married by a friend or family member. If you're doing the ceremony your way, take a look at these tips to help you create a memorable event. Wedding processional or entrance of the groom, wedding party, and bride. You may choose to give an outline of your ceremony in your wedding program. Following the processional, opening words from the officiant start off the ceremony. These can include the "giving away" of the bride or groom, an opening prayer or reading, and a description of the meaning of marriage. "Dearly beloved, we are gathered here today in the presence of these witnesses, to join (name) and (name) in matrimony, which is commended to be honorable among all men; and therefore is not by any to be entered into unadvisedly or lightly, but reverently, discreetly, advisedly and solemnly. Into this holy estate these two persons present now come to be joined. If any person can show just cause why they may not be joined together, let them speak now or forever hold their peace." "Friends, we have been invited here today to share with (name) and (name) a very important moment in their lives. In the years they have been together, their love and understanding of each other has grown and matured, and now they have decided to live their lives together as husband/wife and wife/husband." Another part to this, the "giving away," is considered optional. The traditional wording is "Who gives this woman to be wedded to this man," but in modern weddings, many couples opt for something a little less antiquated, such as "Who supports this couple in their marriage?" or "Who supports this woman in her marriage to this man?" There are other ways to give away the bride if you choose to include this in your ceremony. An opening prayer or reading can be included. This will generally set the tone for your wedding. Wedding readings can be serious, humorous, sentimental, or elegant. Typically, the recitation says something about love, relationships, or marriage. There is usually another prayer, recitation, or song (ceremony music) after the exchange of the vows or the rings. Before getting to the vows, usually, the officiant says some words about marriage in general. He or she will most likely talk about the seriousness of the solemn vow you are about to make and the new life together you are creating. There are samples of wedding vow wording for all types of ceremonies from religious to secular. You can easily find the vows that fit your wedding style and vision. In the exchange of wedding rings, the bride and groom say something like, "I, [name], give you, [name] this ring as an eternal symbol of my love and commitment to you." Many couples choose to add a unity ceremony with the lighting of a unity candle. They may choose to do this in silence, with music playing, or they may recite vows about the joining of their families. The officiant delivers closing remarks. This could be a poem, a prayer, or a sanctioning of the marriage. It is generally the "final thoughts" of the officiant. Next, the big part, the officiant typically says something akin to, "By the power vested in me by the state of _______, I now pronounce you husband and wife. This is followed by the first kiss of the newly married couple. The officiant traditionally says, "You may now kiss the bride," but modern couples often find it strange for someone else to give permission to kiss a grown woman. Instead, the officiant can say, "You may now kiss each other," or the bride and groom can kiss immediately after the declaration of marriage. Usually, the last thing the officiant says is, "I present to you Mr./Mrs. and Mrs./Mr. (last name)," if one party is changing their name or, "I present to you the newly married couple, (name) and (name)," if they are not. The guests stand and applaud as the couple then leads the recessional out.